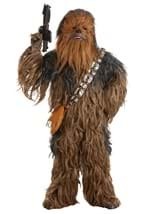 Now you can transform yourself into every one's favorite Star Wars character with this authentic-looking "Chewie" mask. The 100% vinyl mask is painted different brown tones and is textured to give the appearance of hair. Cut-out eye holes and a mouth opening allow you to wear the mask comfortably. The mask covers both the front and sides of your face, as well as the top of your head. Foam padding on the inside of mask makes it comfortable to wear all night long. An elastic strap goes around the back of head to keep the mask in place. 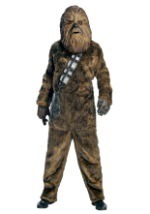 This is an officially licensed Star Wars mask that is great with any of our Chewbacca costumes.